In the Kauearanga Valley near Thames at the start of the Coromandel peninsula is a mighty falls named Billygoat Falls. The Department of Conservation states in their Kauearanga Valley brochure a total cumulative fall of 180m. 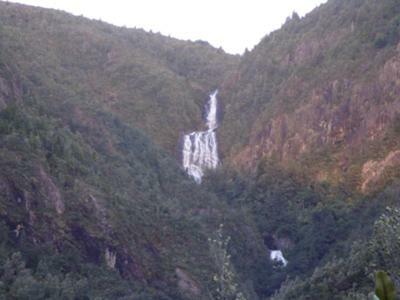 If this is the case, then the Billygoat Falls are in fact the tallest cumulative waterfall in the North Island. However the two main leaps are at the head of the valley, and numerous other falls and cascades make up the total. An Auckland based company www.canyonz.co.nz run canyoning trips down the ‘canyon’ (valley) and their brochure states the first two leaps are 30m and 70m. According to Canyonz the remaining falls are 10m, 12m, 30m & 50m with a grand total of 202m. In my opinion the 153m of Wairere Falls is a better example of a cumulative waterfall measurement but this does not take away from the spectacle of Billygoat Falls.